Luxury skincare brand Crème de La Mer took residency in London’s Soho square last week for their first ever pop up experience. A four day event only, the brand transformed the London townhouse into an oasis of calm in central London where visitors can learn about the story of La Mer while relaxing with refreshments and discovering new products. 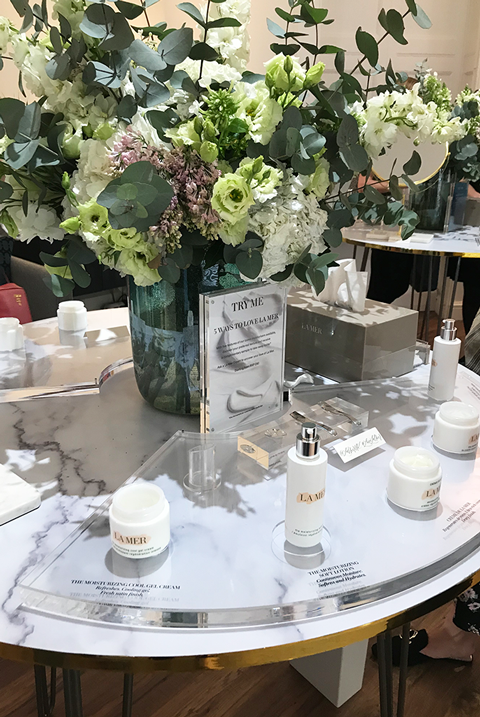 The main focus ‘5 ways to Love La Mer’ showcased a range of creams with the same benefits as the original iconic product but with different textures including a lighter option as well as a cooling gel – ideal for London’s 29 degree heat last week. While offering free samples of the expensive moisturising cream customers were also invited to relax in the Miracle Broth bar on the second floor serving herbal infusions including ‘flowering jasmine tea and an invigorating lime quencher’. Sofas and luxurious sea blue velvet chairs were set against a freestanding wall installation representing in 3D the contours of the sea bed. Overlaid text was positioned to tell the brand story and highlight the details that go into each jar. Personalisation was key on the agenda as customers could get silver lidded pots engraved with initials or personal messages as well as the option to find your own bespoke shade of Skincolour de La Mer. This space was set up on the second floor alongside an express manicure nail bar with staff on hand to talk you through the products and their legendary benefits. Pre-bookable events included an intimate evening with beauty expert Alexandra Steinherr, industry professional Valeria Ferreira as well as 30 minute Miracle Broth facials, and yoga inspired by the ocean.